There are several reasons to forgo Easter egg candy this year at your next springtime carnival event. Why? Well, there are increasing numbers of kiddos with various allergies, including peanut, tree nut, wheat, milk, and soy allergies. Many of these ingredients are present in popular Easter candies. Kids with allergies could unknowingly ingest an allergen that sadly gives them a reaction. Plus, in 2019, health & nutrition are becoming important to many parents, as kids worldwide are increasingly struggling with higher rates of obesity (and health issues related to being overweight). If that's not enough reasons to convince you, we've also had instances during outdoor Easter egg hunts with melting, sticky, messy chocolate in Easter eggs! We believe that some organizations may find it helpful to replace some or all of their candy with non-candy Easter egg prizes. 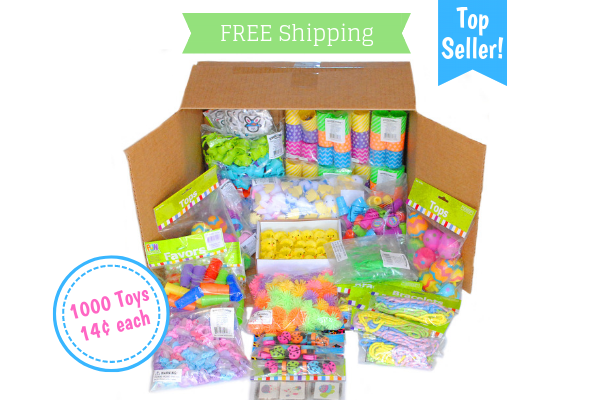 Our alternative idea is cute, super fun Easter & springtime toys! Keep in mind that if you put toys inside of Easter eggs, most kids and parents automatically assume they're candy. So, be careful to avoid toys that look like candy. Sticky toys in wrappers and some mini erasers look a lot like candy. 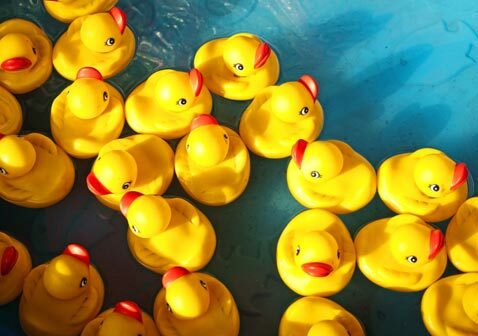 Below, we've devised a list of small, fun toys (that don't look like candy!) as Easter egg candy alternatives. All prizes fit inside a classic-sized 2.5" Easter egg. Enjoy! Also, "Toddlers", young children ages 1 to under 3 years old need special egg fillers. Most candies (especially hard candies) are not recommended for little ones. See our tips at the bottom of this post for egg fillers for toddlers! Check out our puffy pipe-cleaner Springtime Chicks. We think they're precious (and pretty fluffy)! Be warned: there's a chance these popular smiley face Easter Bunny Necklaces could go out of stock, because they fly off our shelves! These cute Easter Spring Toys have cool Easter egg designs and are a great prize to have at your next springtime carnival or egg hunt event! Our fun Mini Easter Skateboard prizes will delight kiddos who find them in Easter eggs! These Colorful Dolphin Keychains are a splashin' good prize to add as an Easter egg hunt toy! These Stretchable Flying Frogs are fun springtime prizes to put inside Easter eggs! Put 2 or 3 Pastel Friendship Bracelets inside of Easter eggs so that kids can share these prizes with their siblings and friends! These Mini Porcupine Balls are a fun Easter egg prize for the kiddos! Kids love these mesmerizing Springtime Spinning Tops - and even adults think they're cool, too! 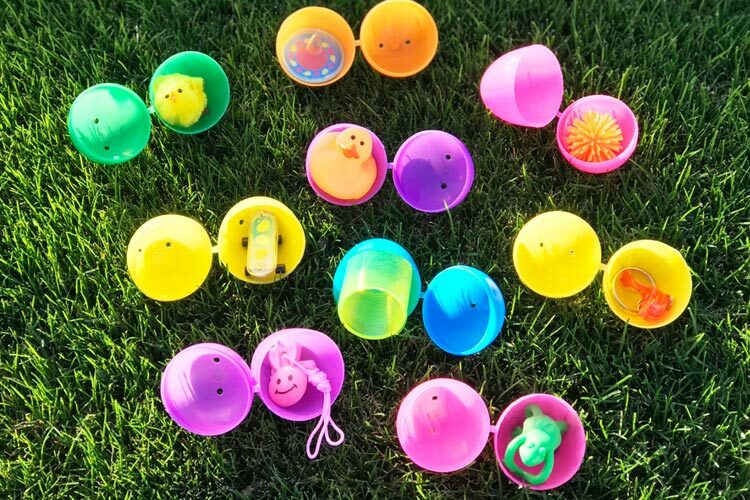 If you are looking for a last minute set to fill loads of Easter Eggs for your community egg hunt, check out our Easter Egg Stuffers and Fillers Bulk Small Toys Set that has 1000 small toys - perfect for making sure children with food allergies and on restricted diets can enjoy the Easter Egg Hunt! For the youngest egg hunters keep in mind that small toys that fit in traditional plastic eggs are considered a chokable - so not safe for children under the age of three years. 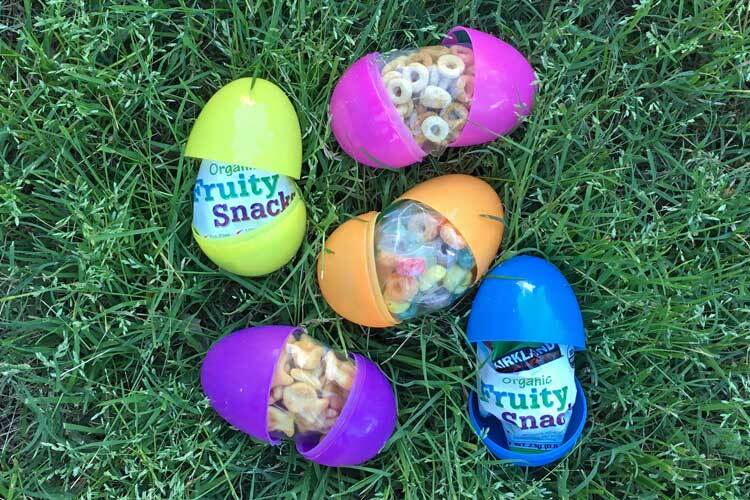 We recommend that you use larger eggs - Toddlers Eggs that can hold safer treats like tiny fish crackers, toddler fruit gummies or even cereal in baggies for the little ones to keep everyone safe! NOTE: the larger eggs are to be used under supervision of an adult as the eggs are not toddler approved. Why? Because most plastic eggs are able to be broken into pieces - those pieces are considered a choking hazard. After the egg hunt, simply collect the plastic eggs so they are saved for next year! Thanks for reading the Carnival Savers blog! We have plenty of other hints & tips from years of hands-on carnival experience, so be sure to check it out below!